The main enemies of vegetables are winter frosts, cold spring temperatures and summer drought. Over the centuries, gardeners have learned to deal with these threats by protecting the soil and their cops from inclement weather. A traditional mulch: In the past, gardeners used a mulch consisting of partially rotted manure. It is easy to break down and ideal for covering - or mulching - the soil. A thin layer of mulch spread over a seedbed promotes germination by helping the soil to retain its moisture. A relatively thick layer enables recently planted cabbages, leeks, celery, courgettes and strawberries to get established. 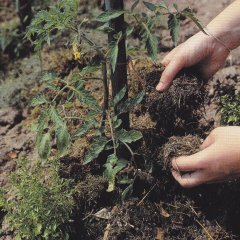 Top tips for effective mulches: Anything that covers the soil and protects it from light and heat can be used as a mulch. There are lots of materials that make ideal mulches and are absolutely free. They all reduce the evaporation of moisture and keep the weeds down. Grass cuttings: These can be spread on the ground once they have dried out. Always spread thinly even if it means renewing regularly - you should still be able to see the soil. If the layer is too thick, the grass mulch tends to form compact lumps that will eventually go mouldy and attract slugs. Flat stones: These make a great mulch while allowing gardeners to walk on them freely. They can be used to cover the soil between rows of crops, and around trailing vegetables such as marrows, which are extremely prone to rotting on cool, damp soil. Paper and cardboard: Newspaper, folded in half or in quarters, and corrugated cardboard, with sticky tape and staples removed, make a practical mulch for widely spaced vegetables. Cover with a scattering of dried grass for a more pleasing aesthetic effect. Spent hops: Available from local breweries, these make a practical, attractive and natural mulch. structure. Add fertiliser to the soil when you dig it over for another crop and it will improve the structure. 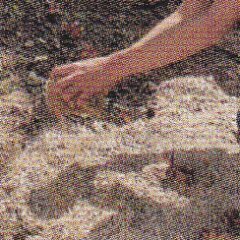 Retaining moisture: Mulching helps to prevent the moisture in the soil from evaporating. The best time to mulch is in spring, when the soil is warm but still moist, and any time after it rains. However, don't mulch when the soil is dry, as this will prevent the rain getting through and just keep the ground dry. You can bring on young plants and seedlings by using a piece of horticultural fleece. You can also use it to warm the soil before sowing. The sheeting creates a snug environment on the surface of the soil by acting as a windbreak, but it allows air and water through. At the beginning of the season,from February to May, it enables you to bring on young vegetable plant two or three weeks early. 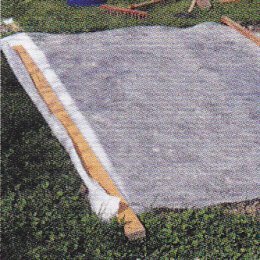 Spread the sheeting on the ground immediately after sowing or planting, leaving some slack so that the plants can lift it as they grow. Weigh down the edges with bricks, pieces of wood or small bags filled with sand or soil. Peas, green beans, potatoes, various salad greens and turnips are ideally suited to this method. 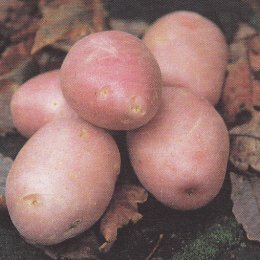 Potatoes are purchased as seed potatoes, which are placed in trays in a frost free, light position and left to 'chit', or sprout - this generally takes about six weeks. They can be planted out once the sprouts are about 2cm long. Once the stems reach 20-23cm high the plants are ready to be earthed up. This is done to prevent any light getting to the tubers, which would then turn green and poisonous.